The world's tallest buildings are guilty of adding 'vanity space' to help inflate their height. Architects use spires and decorations to give their buildings extra metres, resulting in a large distance between a skyscraper's highest occupied floor and its architectural top. The Council on Tall Buildings and Urban Habitat (CTBUH), the world's leading authority on skyscrapers, has revealed a report which shows that the world's tallest buildings have big areas of useless space hidden at the top in order to inflate their height. Image (C) CTBUHAs much as one-third of a building's height can be "vanity space." It was noted in a report by CTBUH that, "without Vanity Height 44 (61%) of the world's 72 supretalls would measure less than 300 measures, losing their super tall status". A building like Burj Khalifa in Dubai has a huge 244 metre spire that accounts for almost one-third of its 828-metre height. Another building, the Ukraina Hotel in Moscow has 42 per cent of unusable space in its 205-metre height. Overall, the CTBUH found that the UAE has the highest number of vain skyscrapers, with an average of 19 percent useless height across all of its tallest buildings. It also contains the world's humblest skyscraper, as the 328-metre Index in Dubai has a vanity space of just four metres. The vainest skyscraper of them all is the Burj Al-Arab in Dubai, which has a useless 39 percent of its 320-metre height. According to current CTBUH Height Criteria regarding telecommunication towers, a 50 per cent vanity height would deem any structure a non-building. 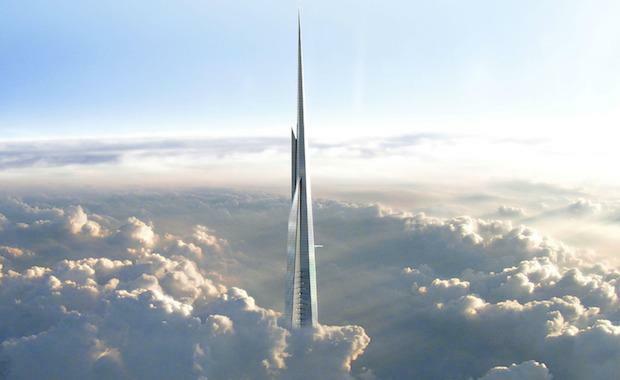 The building that is set to be the world's tallest, the Kingdom Tower in Jeddah, Saudia Arabia which is due for completion in 2018 will stand 1 kilometre high and will also be dubbed a 'vanity' tower.